The Moon’s in Pisces today, hoping to just float along on clouds of wispy cotton-candy sweetness, but that just ain’t happening. The day starts with a Moon/Venus connection that brings on the drama. If people don’t get what they think they deserve, whininess or tantrums ensue. Just assure them that they’re wonderful and try to get on with your day. This is a perfect illustration of what can happen when Mercury is retrograde and other aspects pile on top. The Mars/Saturn clash tells us we need to learn how to deal with delays, obstructions, and frustrations. Our timing may be off and we let loose at inappropriate times, or conversely, don’t speak up or act when we should. We also need to understand limits. There are lines you shouldn’t cross. Mars in Gemini can be very sarcastic, tossing barbs with finesse. Tied into an aspect with Saturn in Scorpio, it only intensifies the tendency to aim for the solar plexus. We may feel this is the only way to defend ourselves, but if we stop seeing the world as a threat, we may not need that defensive armor in the first place. And sometimes you just have to wait it out. The Moon’s stress aspects to Saturn and Mars ignite all the emotional triggers that quickly override our normal boundaries. It gets to us in our most vulnerable place. In Baldwin’s case, he is quick to anger (even I’ve seen him stomping around Manhattan yelling into a cell phone). Since the Moon in Pisces is involved, he was indignant that someone was making up stories about his pregnant wife (Pisces spinning tales, the Moon for his pregnant wife) and felt he had to defend her (Mars aspects, and Baldwin is an Aries, whose ruler is Mars, with Cancer rising, so the Moon is his chart ruler). He also has a natal Mars/Uranus opposition, which indicates he’s a bit high-strung and apt to explode with huge temper outbursts when he feels blocked or challenged, especially if he feels it’s unfair to someone he cares about (he has a Libra Moon). Fortunately for all of us, including Alec Baldwin, as the day progresses things calm down. The Moon trines Mercury at 8:17 PM EDT, so we may finally be able to breach sensitive topics without anyone crying, throwing things, or wanting to punch us out, and at 10:59 PM EDT a Moon/Jupiter parallel opens the doors to some much-needed relaxation. It’d be a great night to get together with friends/family, eat and drink, and enjoy one another’s company. This is probably the most optimistic time of the day today, so take advantage of it. It’s definitely a party or dinner-and-a-movie night. Note: the Moon goes Void-of-Course at 8:16 PM EDT, so after this time it makes more sense to kick back and not launch anything new until the Moon enters Aries at 9:07 AM EDT tomorrow. The Kozminsky Symbol today is quiet apt. It reads like a scene from a 30s film, where somebody with something to hide is trying to squelch an unfavorable story. The proof stage occurs before the paper is printed, when corrections can still be made. There’s a hint of dark doings here, coercion, and pay-offs. The editor is in a position of power and knows the dark side of those who appear in his/her paper each day. Will they be honest and print the truth, or through fear or greed muzzle the story? It was a “gutter press” type of story that set off Alec Baldwin. Our Symbol involves issues of integrity, privacy, truth-telling, and dealing with powerful information. It also raises the question: “Who’s pulling the strings?” We’re being warned today that we may not fully understand the situation, which is one reason it’s a good idea to take a step back before we respond. Today is not the day to overreact or jump into something without researching the situation. Things may not be as they seem. The Sabian Symbol reminds me of those fanciful postcards that were popular years ago featuring animals dressed in little hats, jackets and boots. “Bunnies on parade” is an amusing and image, bringing in the Moon in Pisces tendency to whimsy. Using the imagination, playing a role, “trying it on for size”, are all indicated here. Venus in Leo loves a parade—it’s a chance to get dressed up and win everyone’s admiring gaze. This Symbol also urges us to be bold in creating our own reality, to step out of our usual habit patterns. 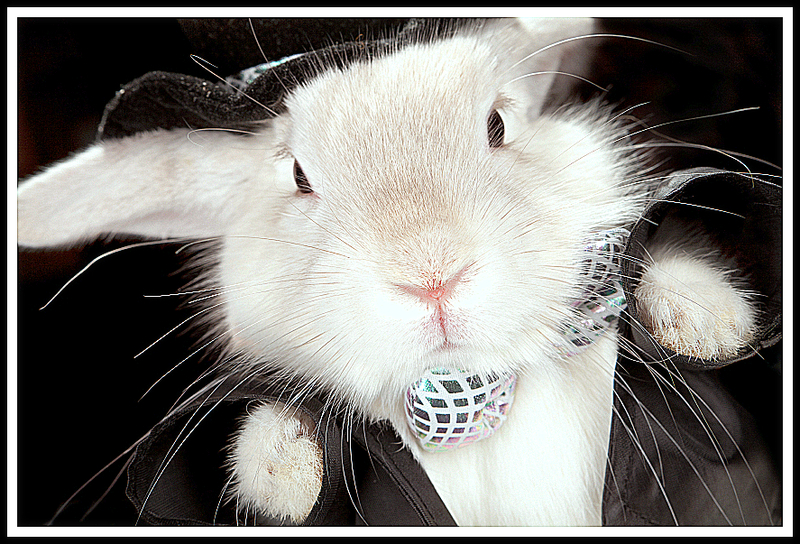 Get surreal: be a bunny in a frock coat and big flower-festooned Easter hat! This Symbol is about ambition, working towards a dream, experimenting to determine what “fits” us best, and believing that anything is possible. Be playful, don’t be afraid of looking silly, do something no one expects. Aim high. This is like the stories where people switch identities with each other to get a taste of how other people experience life. Obviously, this is a great Symbol for actors or children’s book writers! On the down side, we’re taken down the rabbit hole and it can lead to lying or giving out half-truths, exaggerating, being over-ambitious, operating in disguise, trying to be something we’re not, or being fooled/believing everything we hear. “Give It Away Give It Away Give It Away” Here we have two Pentacle cards, so we’re dealing with what is, what exists, earthly reality, the body, financial matters, and all things that exist on the physical plane. What’s the flaw in the character here? Holding on to too much for too long. This combination is telling us not to be misers in any area of our lives. This combo is like making a ton of money but refusing to use it, invest it, or pass it along. There’s a fear of change, a desire to remain in stasis, a dread of letting go. The 4 of Pentacles can be a card of anger and frustration (today’s themes!) The door is open, we must walk through. The Six of Pentacles is a more balanced card that relates to giving and receiving. Sharing, rather than hoarding, is the goal. We may receive an offer, find an investor, or discover new ways of using our resources. This combo is like the Kickstarter of Tarot. Find something you believe in and encourage it to grow. Be generous, open out rather that shut down. Learn how to receive, too. The 6 uplifts, like today’s final aspect (Moon/Jupiter). When we’re happy we want to share that happiness with others.